Last month was The Guardian Book Season – A very exciting thing for bookworms all over Britain and beyond. It included a huge book swap, which book lovers across the UK got involved in, leaving their used books on park benches, at bus stops and in coffee shops. A @GdnBookSwap Twitter account was opened and photos of dropped and found books popped up everywhere. Unfortunately I was not lucky enough to find a book, but I did leave a couple of my own lying around for others, wanting to spread the joy of reading. It is lovely to celebrate something as important as reading and to get people involved in sharing their favourite books. Hopefully it also encouraged people, who wouldn’t normally, to pick up a book and start to read. To mark the end of the Book Season, The Guardian added a free book of short stories to the Saturday edition of the newspaper. With authors such as Margaret Atwood and Audrey Niffenegger contributing, this was something I could not miss! So I rushed out on Saturday morning to get my copy and almost immediately sat down to read the eagerly awaited book. As with all books of short stories, this is a mixed collection. There are killer machines, unhappy painters, enthusiastically religious mothers, absent minded middle aged women and books that come to life, all squashed into these thin and flimsy pages. There is also a strong theme present throughout many of the stories – Love. One of my favourites is the heartbreaking The Closing Door by Rose Tremain which follows a mother’s struggle to say goodbye to her daughter who is leaving home for the first time to attend boarding school. This tale really does pull on the heart strings, as the poor mother wonders around London, feeling lost and alone, her world losing meaning while her daughter is not there. Another unhappy tale of love is William Trevor’s An Idyll in Winter. Mary Bella, a young girl, falls in love with her summer tutor, Anthony. He, being much older, leaves and makes a life of his own with a wife and two lovely daughters. But that all gets turned upside down and confused when he meets Mary Bella again a few years later. The final story in the collection, The Man Who Fell by Polly Samson is about the all consuming effect of young love, first loves and love for a parent and the familiarity of a family home. As Julian sits on a train home to see his mother, a day late for her birthday, he feels the guilt of not being there for her special day. Trying to explain to her why he is late turns out to be more difficult than he thought and she has some news for him too. A fascinating assortment of short stories, definitely worth waking up early for, this book has opened my eyes to some new authors that I’ll be looking up on Amazon in the near future! 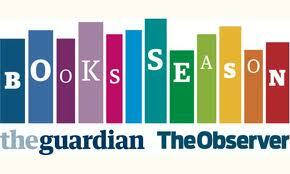 Thank you The Guardian for a wonderful Book Season! As well as the authors mentioned above, there is also work from Chimanda Ngozi Adichie, Helen Simpson, Mohsin Hamid, Rachel Cusk, Margaret Drabble, and Hisham Matar. If you want to read them for yourself, visit The Guardian. It sounds like a great concept! Glad you found some new authors. I look forward to your reviews! It is fantastic! 🙂 You can find all of the stories at the Guardian (click on the links in my post). I only couldn’t find The Closing Door.